The transport of fresh products has to meet a high level of reliability and strict performance requirements. Estivin Logistique Services has been using the on-board computer solution of Trimble Transport & Logistics for improved communication with its drivers and to gain productivity, since summer 2013. Up to now, on-board computers were either badly operated by the drivers or they did not work properly; they actually could not cope with the problems my profession was facing and I had a lot of trouble finding the right tool. But I finally managed to resolve it with the solution of Trimble Transport & Logistics, with which 35 of my trucks have now been equipped since July 2013. The result: we extensively considered and discussed the choice of the supplier. We reached our decision on the basis of three objectives: the reliability of the information between operators and drivers; compliance with the regulations and security; and improving our productivity. The first point — real time information — consists of monitoring the daily trips. “In just one single day Trimble built an interface between its solution and our transport software — the TMS Sigem used for the trade of fresh products (the second ELS business)”, director Maxence Vandermulen is pleased to tell. “We very quickly started using electronic road maps in the vehicles”, Maxence Vandermulen continues. “Both the drivers and the operators wanted an automatic system for transmitting addresses and delivery confirmations. Today, everyone has approved of the change. They gain a lot of time.” And what about the requirements of collecting fresh products in the rural areas of the large western region, on roads that are not mapped, where the GPS is indispensable but navigation always remains a human effort? Within six hours after collecting, the goods must be delivered in Rungis or Lyon. As we are responsible for living products we have no right to make any mistakes. If we are late, the sale is cancelled and we will have to pay for the palette. That is why we need to make operations more reliable using computers. Our profitability depends on our capacity to inform and anticipate. 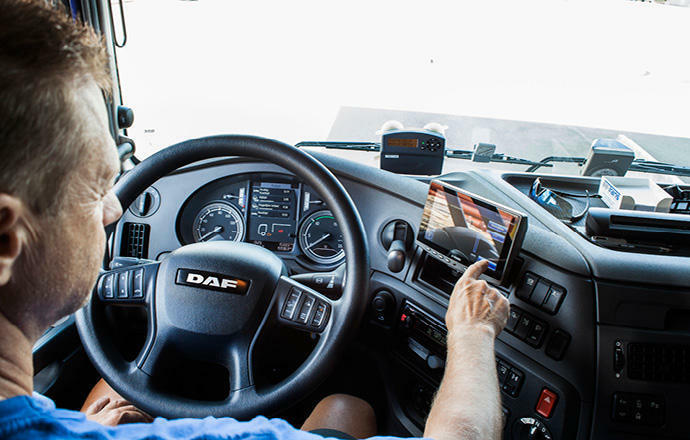 For the performance indicators demanded by the large brands for monitoring driving hours and fuel consumption there is a permanent link between the CarCube on-board computer and the company’s computer system. Smooth operational flows without Trimble telematics are now unimaginable in our company. “We have 80 drivers driving 35 trucks in 24h/24 shifts. The drivers hope for the implementation of a driver challenge, maybe with associated incentives per team. For this, however, we first need to be able to retrieve reliable information. At the same time, our next objective is to make people aware of and help them drive in an ecologically responsible way”, Bernard Estivin continues. For a proper use of the numerous CarCube functionalities and especially the driving profiles there is a specific self-training for Trimble’s on-board computer, so there’s no question of putting the cart before the horse! Phase by phase, Bernard Estivin counts on the consultation and appropriation of new technologies by his team. Estivin Logistique Services’ main activity is the transport and logistics of fresh products exclusively under controlled temperatures (positive and negative). With a fleet of 35 vehicles, equipped with the Carcube on-board computer, Estivin Logistique Services operates throughout France.